While many of these AGMs would move around towards the end of their career, this week's installment was on the go from the start. Over his 15 season career, he played in 14 different cities for 16 different teams. He was well-travelled, but not well recognized. So, that's what will happen now-- this week, the profile of Carl Wetzel. Wetzel started his trek, literally, with the only team he had stability with-- the Hamilton Tiger Cubs of the OHA Junior "A" league starting in the 1956-57 season, playing in 48 games and finishing with a 24-22-2 record; the 1-3 in four playoff games. The 1957-58 season had Wetzel play in 50 games compiling a 26-17-7 record, then going 8-6-1 in 15 playoff appearances, losing in the finals to the Toronto Marlboros. He would also play 25 games in the 1958-59 season with Hamilton, but no record is indicated. Wetzel would also play one game that season with the WHL's Edmonton Flyers, which was a loss. The nomadic side of Wetzel started with the 1959-60 season playing 62 games with the Omaha Knights of the IHL, but no record is given; then in the 1960-61 season-- Wetzel played 52 games for the IHL's Indianapolis Chiefs (no record), then played in the WHL with the Spokane Comets for five games (0-5-0), then was loaned out to the IHL's Fort Wayne Koments for eight playoff games (3-3). In the 1961-62 season, Wetzel played in the EPHL with the Sudbury Wolves, going 25-26-10 in 61 games and 1-4 in five playoff contests. After that season, Wetzel would put his career on hold due to military services (likely due to the US Draft) and would only suit up once in the 1963-64 season as an emergency back-up to the WHL's San Francisco Seals. Upon his return in the 1964-65 season, his hometown team, the Detroit Red Wings, picked him up-- but he would only play two games for them (0-1-0), while also spending four games with the AHL's Pittsburgh Hornets (1-3-0). 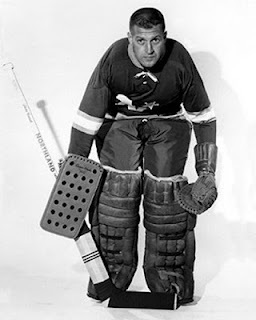 The Montreal Canadiens claimed Wetzel in the Reverse Draft before the 1965-66 season and would place him in the CPHL with the Houston Apollos; where he would play 51 games with a 21-24-6 record. Wetzel would also play one game for the AHL's Quebec Aces-- a loss. Wetzel left the Canadiens organization to play for the USA National Team in the 1966-67 season. He would play 12 games throughout the season, as well as seven games in the World Hockey Championships. In the World Championships, Wetzel went 3-3-1 in seven games and be named Best Goaltender in the tournament and named to the All-Star Team. In the summer of the 1967, the Canadiens traded Wetzel to the expansion Minnesota North Stars for cash. Wetzel, along with Bill Masterton, were the first two signed to the North Stars. Wetzel would play five games in the 1967-68 campaign with the North Stars finishing with a 1-3-1 record; but would spend most of the season with the CPHL's Memphis South Stars for 20 games, finishing with a 8-9-2 record. A more masterful memory for Wetzel was bring loaned to the AHL's Rochester Americans for ten games (3-3-1) and then 2-1 in the playoffs, helping them win the Calder Cup championship. The 1968-69 season had Wetzel back with the Memphis South Stars for 39 games, while also playing two games for the AHL's Cleveland Barons, winning the game he was in on the decision for. The 1969-70 season had Wetzel play four games for the USHL's Rochester Mustangs, but would go back to play with the US National Team for 17 games. In the 1970-71 season, Wetzel stayed with the US National Team, playing in the World Championship again-- but wouldn't fair as he did in 1967-- finishing with a 1-6-0 record in eight games of the tournament. Wetzel would cross over the Europe for the 1971-72 season with KAC Kitzbuhel in Austria, playing in 44 games before returning to North America and the WHA in the 1972-73 season with the Minnesota Fighting Saints, losing the only game he played. He would retire after that last season. After taking time off, Wetzel did return to be an assistant coach for the North Stars in the 1987-88 season, but would drop off the map after that until he came back for the Minnesota Wild hosting the "Back on Home Ice" reunion for the North Stars March 29-31, 2012. He went everywhere and Wetzel tried to make the most out of it. He saw a lot of North America and some parts of Europe when playing with the National Team. He served his country in military duties and in hockey duties. He was a hustler in order to sell himself off as an option to teams and he would do what he could to get some playing time.